While it might surprise visitors, Phoenix, Arizona, is filled with art. In a region with so many galleries, art fairs, studios, and museums, it can be hard to know where to look! To help you out, I’ve created a brief introduction to some of the best Phoenix art museums: The Phoenix Art Museum, the Scottsdale Museum of Contemporary Art, the Heard, Western Spirit, the Eddie Basha Collection, and the Musical Instrument Museum. The vibrant art scene found in Phoenix and the surrounding area can be found in galleries, art fairs, and museums. But the best Phoenix art museums offer the opportunity to immerse yourself in some of the region’s – and the world’s – great art. While there are museums of all types in Phoenix, the museums highlighted here are not only the best art museums in Phoenix, but many are also among the best things to do in Phoenix in general. They’ve earned that status by consistently exhibiting world-class collections in ways that engage even those visitors who don’t think they like art! Of course, there is also a great gallery scene in Phoenix and Scottsdale. For those interested in mixing up their art viewing a bit more, a number of the best art museums are located near galleries, making it easy to combine an art museum visit with a bit of galley hopping. Looking for a traditional art museum with a broad, well-displayed collection and intriguing special exhibits? The Phoenix Art Museum is the place for you. Part of the downtown Phoenix arts district, the Phoenix Art Museum supplements the local arts scene with well-curated and thought-provoking exhibits that cross time and space. You really never know what you might discover. The museum’s regular exhibits draw from more than 19,000 items in collections focused on American, Western American, Asian, Latin American, and European art; modern and contemporary art; and American and European fashion. 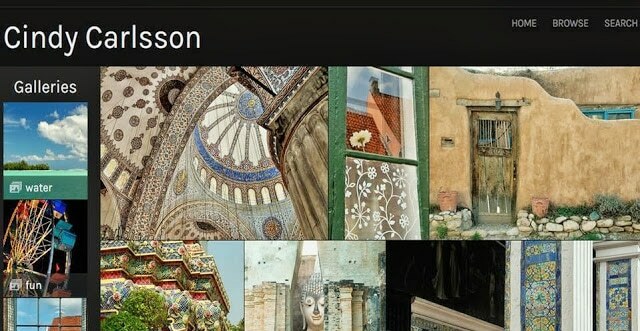 Regular rotating photography exhibitions are provided through a collaboration with the Center for Creative Photography at the University of Arizona. 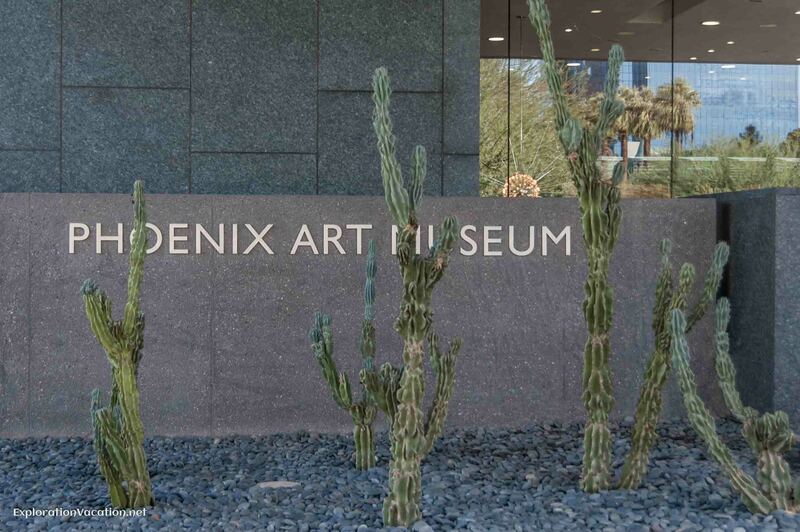 The Phoenix Art Museum also provides a broad range of special exhibits, programs, and events. General information for planning a visit to the best art museums in Phoenix is provided below. See the Phoenix Art Museum’s website for more detailed information on visiting the museum (including opportunities visit for free) and current exhibitions. To dive deeply into the cutting edge of fine art, head over to Scottsdale’s Museum of Contemporary Art. This is the smallest museum on this list, but if edgy contemporary art, design, and architecture interest you, SMoCA is the place to go. Even if you don’t think it’s your thing, SMoCA is often open at no charge, allowing you to take a look for free! Aside from the James Turrell skyscape constructed alongside the museum, there is no permanent exhibition at SMoCA and exhibits change frequently. It might be a different museum every time you visit. General information on planning a visit to the best art museums in Phoenix is provided below. See the Scottsdale Museum of Contemporary Art’s website for detailed information on visiting the museum and current exhibitions. You’re in the southwest, so it’s a good time to explore the art and culture of the people who have lived here for thousands of years. Luckily, the best place in the world to do that is right in the heart of Phoenix at the Heard Museum. A complete overhaul of the Heard’s exhibit space a few years ago resulted in a comprehensive permanent exhibit on the people of the southwest. It also resulted in gorgeous spaces for temporary art exhibits. While a large portion of the permanent cultural exhibit is historical in nature, the Heard’s current mission is focused on advancing American Indian art. That means a good share of gallery space is devoted to rotating art exhibits drawn from the Heard’s vast collection and special exhibits that draw on Native American work from other institutions or individuals. Of course, many works of art are also included in the permanent cultural exhibits. In addition to the art on display in the Heard’s galleries, a walk through the museum’s gift shop provides a good look at some of the finest work being produced by Native American artists today. (Pretend it’s another museum exhibit if you are on a budget.) An even more amazing selection can be seen each spring when top Native artists sell their work and compete for prizes at the Museum Guild’s annual Indian Fair and Market. The Heard also provides a broad range of special exhibits, programs, and events throughout the year. General information on planning a visit to the best art museums in Phoenix is provided below. The Heard’s website includes more detailed information on visiting the museum, current exhibits, and the museum’s collections. For many people, the American West means just two things: Cowboys and Indians. While the Heard Museum is the best-known place to go to explore the art and culture of the American Indians of the western United States, it’s not the only place. Both Western Spirit and the Basha Collection exhibit Native American art from the southwest. But both also have large collections of “cowboy” and other art with western themes. Scottsdale’s leaders long dreamed of building a museum that reflected the city’s claim as the most western of western cities. A few years ago that dream became reality with the opening of Western Spirit, Scottsdale’s Museum of the West. 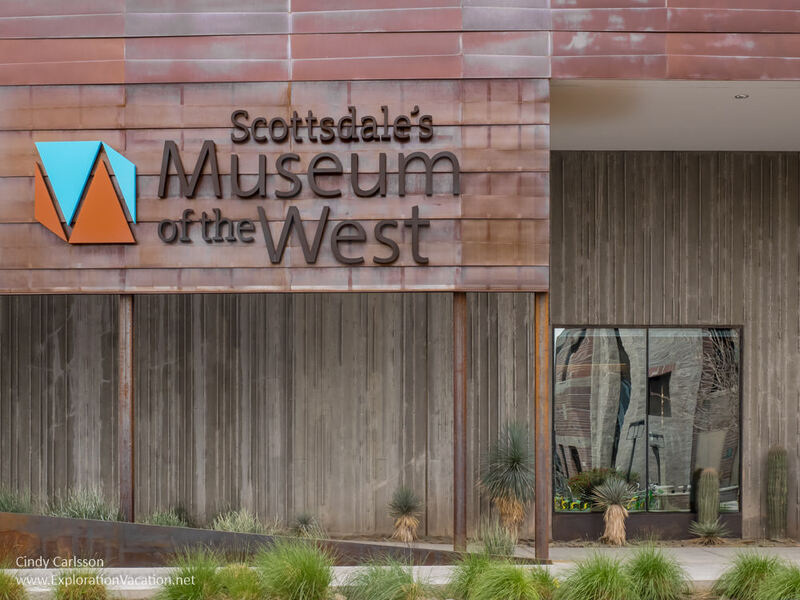 Scottsdale’s western art museum is a gorgeous state-of-the-art facility that uses art to explore the myths and realities of the American West past and present. It can be a bit high-concept at times, but there are wonderful pieces on display throughout the museum and the main floor galleries are particularly well-designed. Western Spirit has a mix of semi-permanent exhibits and temporary installations. Besides the two mostly-permanent historical exhibits on the second floor, visitors can generally expect to find an exhibit of contemporary bronzes, Western movie posters and memorabilia, Hopi pottery, and the Spirit of the West collection of cowboy memorabilia. These are supplemented by a variety of other themed exhibits that change a once or twice a year. I’ve visited Western Spirit a couple of times, both as a guest of the museum and as a paying customer, and was impressed with what I saw. Scottsdale’s Museum of the West may be new, but the material on display would be the envy of any museum. The home page for Western Spirit, Scottsdale’s Museum of the West, provides links to more information about the museum and its collection. Information for planning your visit to best art museums in Phoenix is found below and on the museum’s information page. To discover the hidden gem in the Phoenix museum scene, head south to the Eddie Basha Collection of Contemporary Western and American Indian Art in the headquarters of the Basha grocery chain in Chandler, Arizona. The galley displays the personal collection of the late Eddie Basha. An avid collector from a young age, Basha loved western art – both cowboy art and American Indian art – and loved meeting and interacting with the artists who created it. That interest, along with a good eye, some knowledge, and the money to pursue the best contemporary pieces available, led to an almost encyclopedic collection of contemporary western art. And that collection is open to the public at no charge. The contemporary western art collection includes work by most of the top cowboy artists. The work covers a wide range of media, include paintings, drawings, sculpture, carving, and more. There is also includes a fascinating selection of illustrated letters to Mr. Basha from various artists. Likewise, the contemporary American Indian collection includes work in a wide range of media by many of the best-known contemporary artists. However, the highlight has to be the vast collection of carved kachinas and drawings by Cecil Calnimptewa. A small gallery houses an astonishing collection of historic southwestern baskets collected by Mr. Basha’s aunt. There are over 3,500 pieces on display in the gallery, most of which are grouped by artist for display. As a private collection, it reflects the interests and tastes of one individual. It may lack in balance in some areas (rooms filled with kachinas, but relatively few pots), but the quality and quantity of items on display make this a must-see museum for anyone interested in contemporary cowboy or American Indian art. And you can see all of it for free. General information on visiting the best art museums in Phoenix is provided below. Check the Eddie Basha Collection’s website for more information on the gallery, to take a virtual tour, or see some of the collection online. A musical instrument museum might seem like an odd addition to a list of the best art museums in Phoenix, but the Musical Instrument Museum north of Phoenix includes a lot of visual artistry in its vast collection. Some of the museum’s exhibits are all about the visual arts, whether it’s an exhibit of exquisitely inlaid guitars or a gallery filled with portraits from the golden age of jazz. But even the regular exhibits include a lot of visual art. Sometimes that comes in the form of and decorations on the instruments themselves, sometimes in the costumes worn by performers, and sometimes in the more traditional forms of paintings, photographs, carvings, and videos of musicians and musical instruments. This is a spectacular museum (when the headphones work) and it overflows with visual art right along with the music. General information on planning a visit to the best art museums in Phoenix is provided below. he Musical Instrument Museum’s website includes more detailed information on visiting the museum and its current exhibits. The six museums presented here are not only the best art museums around Phoenix, Arizona, but most are among the best of their type anywhere. And, as long as you have a car, it’s easy to get to all of them from anywhere in valley. As you plan your exploration, keep in mind that most of these museums have large collections with many, many items on display. With the exception of Scottsdale’s small contemporary art museum, you probably won’t want to do more than one museum in a day unless you are just passing through on an Art Walk. To really explore these museums, plan to spend at least three or four hours in the galleries. Phoenix is infamous for its auto-centric culture. That means you’ll have to travel north and south across almost the entire Phoenix metropolitan area to visit all six museums. But that also means that at least one of these great museums probably isn’t too far away from you! And a few are within walking distance of each other and other artsy things to do, making it easy to plan an arts-filled day. Check out the Phoenix Art Museum and the Heard. The Phoenix Art Museum sits amid other modern glass and steel buildings just north of the funky galleries and studios of the Roosevelt Row Arts District. It’s easy to combine a visit to PAM with a stroll through Roosevelt Row – especially during the First Fridays Art Walk when the museum and galleries are all open late. Of course, a short walk the other direction, heading north along Central Avenue instead of south, leads to a pleasant historic residential area and the parklike grounds of the Heard Museum. Both of these downtown Phoenix museums are located near rail stops along Central Avenue, both are open late (and free) for the monthly First Friday Art Walk, and both have excellent in-house cafes. Scottsdale has always taken pride in its reputation as an arts center, so it’s no surprise that two of the best Phoenix art museums are located in the town’s historic heart. Despite being located a short walk from each other, Western Spirit and the Scottsdale Museum of Contemporary Art offer stark contrasts in form and content. But that shouldn’t come as a surprise either. While Scottsdale still overflows with galleries featuring Western art, they’ve been joined by a wide range of galleries showing contemporary work that would be right at home in New York or Los Angeles. You can take in the best of it all on a visit that includes both museums and a few of the many galleries that line the street between them. And, if you really want to take in Scottsdale artistic vibe, plan your visit for a Thursday evening when the area comes alive for the Art Walk. The Musical Instrument Museum is located northwest of downtown Scottsdale, up near the northern edge of the Phoenix area. Unlike the downtown museums, MIM is in a rather isolated location. Visitors seeking a lunch break will find the museum’s cafeteria is the only option that doesn’t require getting in your car. However, if you do get back in the car, you’ll find a number of restaurants in the area. There are a number of fancy resorts up here (including the beautiful JW Marriott Desert Ridge where I stayed many years ago). If you happen to be staying in the area, buy the Musical Instrument Museum’s two-day pass and spread out your time at the museum. You’ll see more over two days and you’ll enjoy your visit more. Far from the arts scene to the north, the Eddie Basha Collection is located in a light industrial area in suburban Chandler. This is the southern end of the Phoenix area, so it’s a bit of a drive from Scottsdale or even downtown Phoenix. Fortunately, it’s worth the drive. There is a suburban commercial area with an assortment of restaurants not too far away. Check the specific museum website for exact hours, but the following is a general guide to when the best art museums in Phoenix are open. All are normally open Tuesday through Sunday, except the Basha Collection, which is open Mondays, but closed on weekends. If you’re looking for things to do in Phoenix on Monday, the Heard, Basha Collection, and Musical Instrument Museum are all open. The Basha Collection never charges an admission fee. At the other museums, regular adult (including senior) admission fees run from a low of $10 (SMoCA) to a potential high of $23 (PAM). Admission for the Phoenix Art Museum varies depending on what galleries and special exhibits are open (admission includes all special exhibitions) and the day and time of your visit. Generally adults can expect to pay $15-$23, but there are times when admission is by voluntary donation (free). If free or reduced admission is important to you, check the rather complicated details on their website before you go. In the past, PAM has also offered Groupons for discounted admission. The Musical Instrument Museum has also run Groupons for admission, but they don’t seem to be any cheaper than the regular admission cost! Check before you buy. If you are looking for free things to do in Phoenix, the Eddie Basha Collection is one of the few totally free museums in Phoenix. There is no admission charge for anyone at any time, although donations are welcome. Western Spirit is free for Native American visitors, but only through this December. Most museums also offer free or reduced admission to military personnel and/or veterans. Check with the museum to be sure. There are no free days or evenings at either Western Spirit or the Musical Instrument Museum. Wow! Six museums to visit! 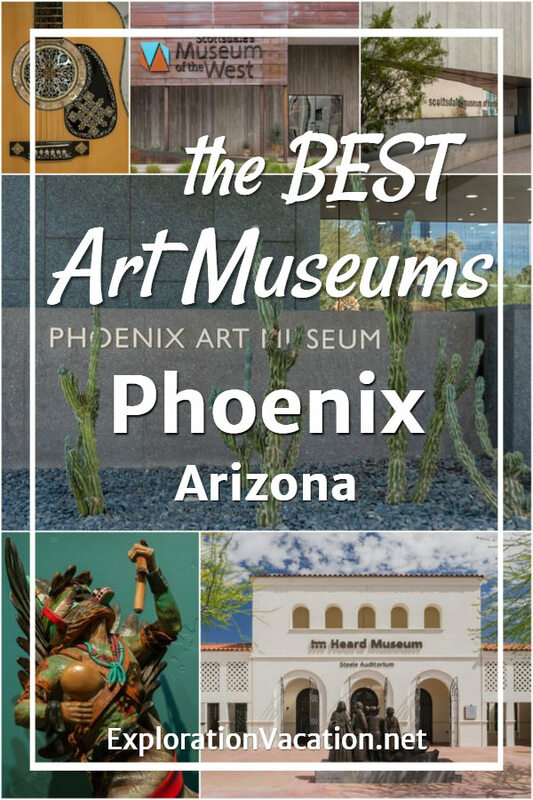 I’ve not yet been able to spend time in Phoenix (just have flown in and out) but would love to visit and put several of these museums on my list. And I like the fact that some of them are free or offer reduced admission for veterans. Super post. I, too, was surprised at the prominence of art throughout Phoenix and Scottsdale. We didn’t make our way through the list, but certainly enjoyed the Musical Instruments Museum. Thanks, Doreen. I’ve been exploring Phoenix for years, so lots of opportunities to check out the arts scene. You have lots to look forward to! I never miss an art museum when I travel. If I ever get to Phoenix, I’ll check all of these out. Top of my list is the Basha Collection of Contemporary Western and American Indian Art. I’d like to learn more about Indian Art, and the fact that it’s free doesn’t hurt either. What an amazing collection of art museums all in one city! I’d be particularly interested in the Native American art and the Museum of the West. I think you’d see some great art and have a deeper understanding of the various people and cultures of Arizona. I hope you get a chance to check them out some day! I need to find out hours for Basha Museum in Chandler. Can you help me?